Don’t let vegan food scare you off. 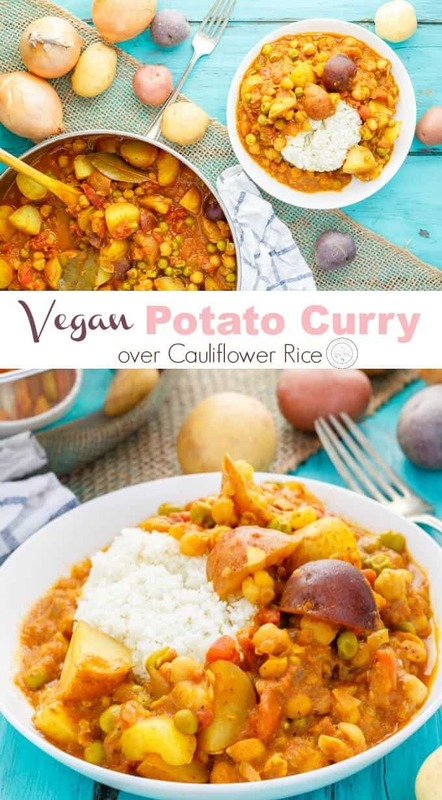 This vegan potato curry over cauliflower rice has won over the biggest meat-eaters in my house (both my husband AND my daughter!) 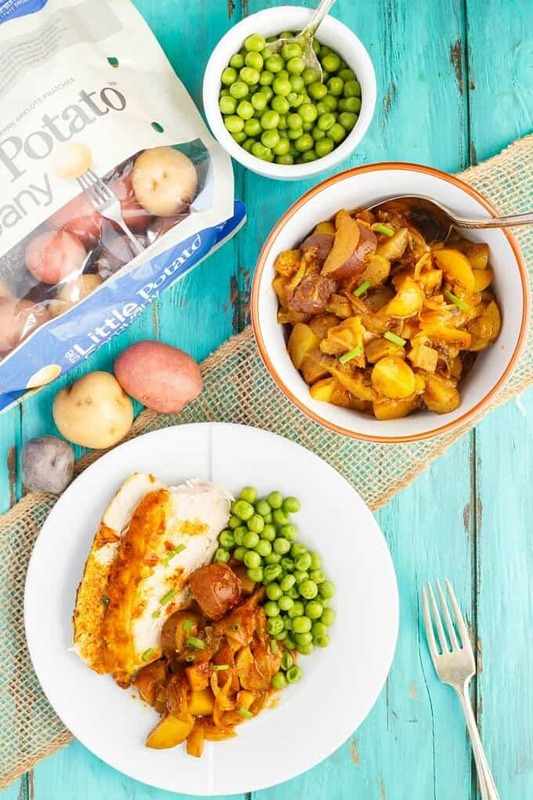 Stay tuned as I share with you my latest (gluten-free) recipe as I continue my brand ambassadorship with The Little Potato Company! Second week into January and I have totally stuck to my healthy eating habits… Not! And for my first Little Potato Company post of the year?! 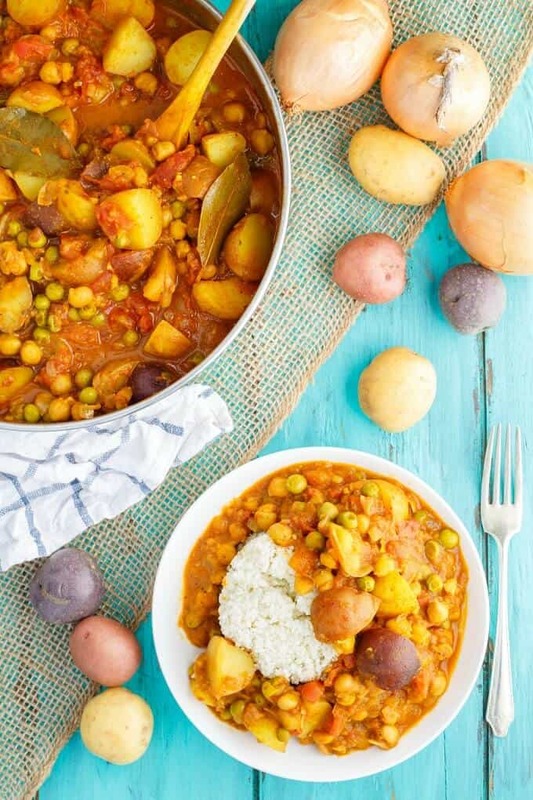 This healthy, gluten-free, vegan potato curry over cauliflower rice. See, I can be healthy! Super impressed with this recipe! My daughter, husband, and myself actually fought for the last bowl. I would totally have made another batch but was out of coconut milk (cursing myself because I had a can in my hand the other day and put it back because I thought I had an abundance!) Honestly, I am just happy my daughter really enjoyed it! 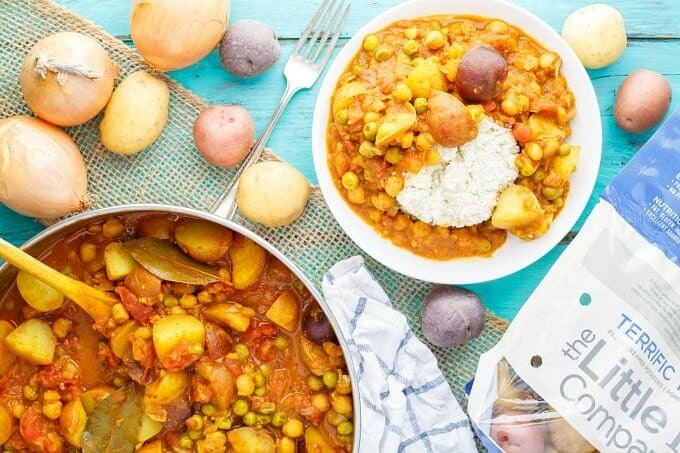 No way did I have curry growing up, and I used to actually dislike it, but as I have grown older, curry has only gotten better to my taste-buds! But what isn’t expensive? 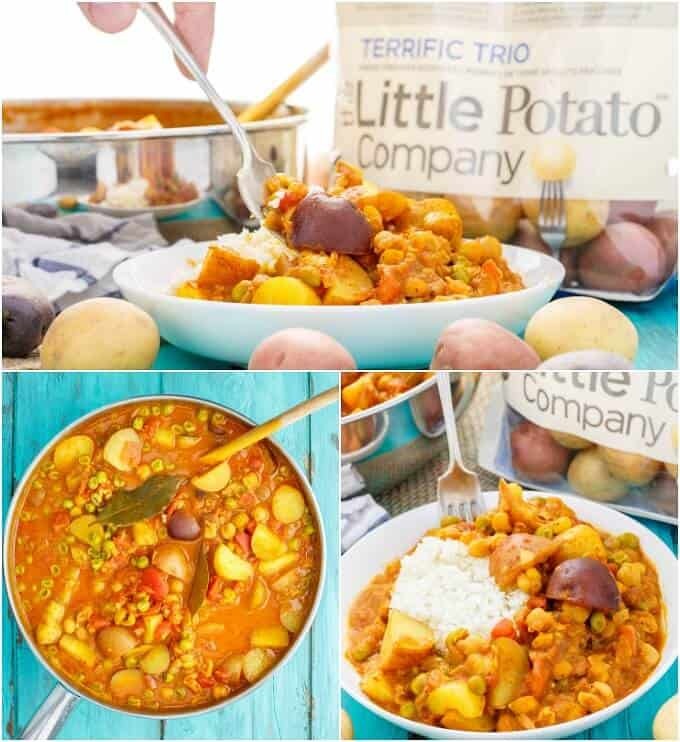 All the varietals from The Little Potato Company! I swear by these bags, and so do my friends and family. I have brought them over to the dark side, muahaha. Okay, there are nothing dark about these potatoes at all, and if anything they are very light and refreshing. And perfect for those New Year resolutions! Well, as you can see in this vegan potato curry over cauliflower rice recipe, I went with the Terrific Trio varietal. I love all their products, but I chose these guys because of their colour and the wide variety you get in the package. Three different varietals in one! And these Creamer potatoes are naturally fat-free, cholesterol-free, and only 20 calories each! (source.) Seriously, check out that source, because there are just so many amazing things about these potatoes that I feel I cannot do them justice! 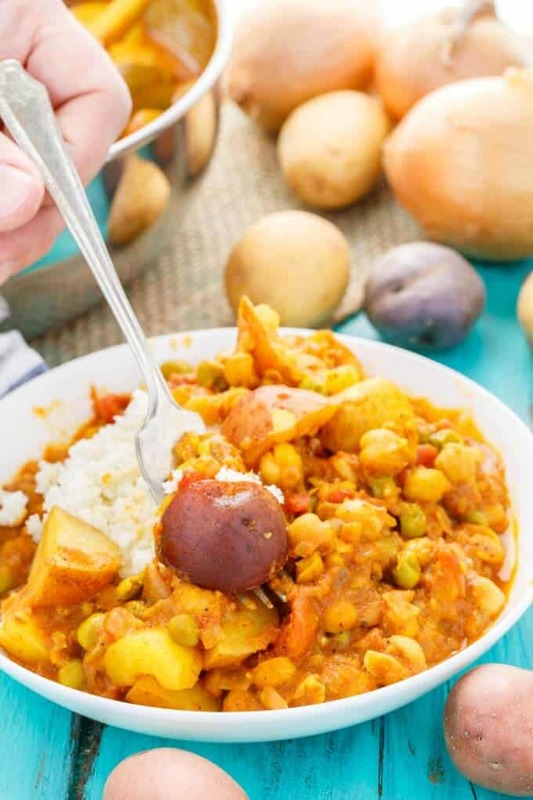 A mild curry that is perfectly healthy for the New Year! Gluten-free, vegan, and just all-around amazing! 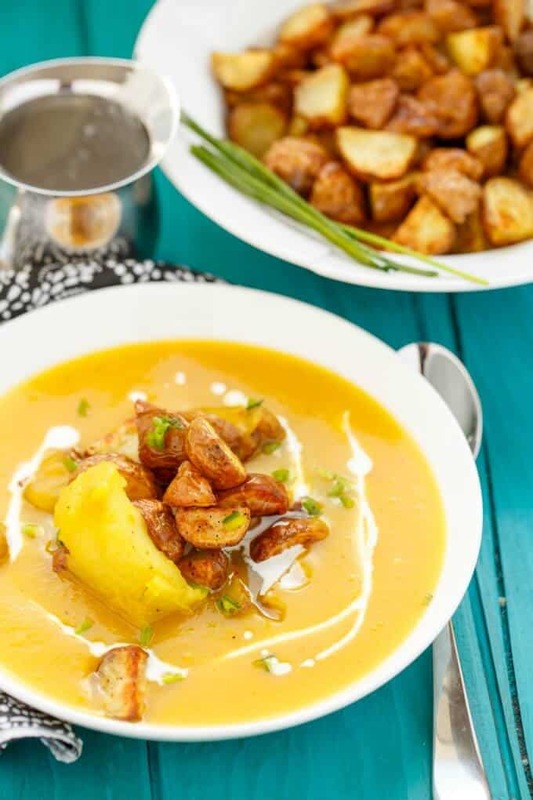 If you like a stronger curry flavour, I suggest doubling the curry spices in this recipe! 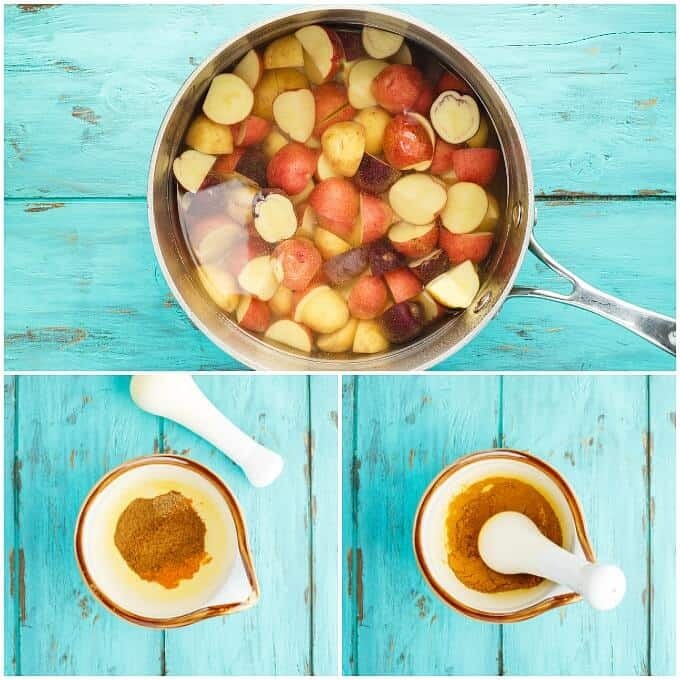 Cut potatoes in half or quarters and place into a large pot. Fill with cold water and season with salt. Bring to a boil and cook until fork tender, 5-7 minutes. Drain and set aside. You can use jarred sauce here, but to make your own, place a small frying pan over medium heat. Toast the mustard seeds, cumin, coriander, turmeric, cayenne, and garam masala together, pouring into a mortar and pestle. Toasting these spices takes seconds, so don't skip and remove from heat once they begin smoking! Add untoasted nutmeg to other spices. While meal is cooking, grate cauliflower on large-hole cheese grater or process in food processor until cauliflower resembles "rice." Place in a microwave safe bowl and cook for 5-7 minutes, or until tender. Season with salt and pepper. You can use your favourite jarred curry in place of the homemade version. Save time by cooking the cauliflower rice as your curry simmers! This is a MILD curry. For stronger flavours, double your curry spices. I accidentally added a 28 oz can of diced tomatoes and the recipe was still fantastic!